The secret garden motif involved a bit of crafting. Some elements (such as the Italian ruscus-wrapped leads for the over-size balloons and the hand-painted macarons) were tackled beforehand and used as decoration. Others, like the floral crowns, were entertainment. For those, Blythe walked the mothers through a few simple steps, then they coached their daughters along. Here, get tips on the DIY for your own springtime fête. Tape the Italian ruscus to the circlet, allowing the leaves to sprig out. Affix several strands onto the circlet for a full look. Choose blooms (the amount depends on how dense a crown you wish to have) and snip the stems, leaving an inch or two. Tuck the bloom in between the leaves and tape the flower stem to the crown base. Repeat until you’ve got your desired look. Mix colors, vary sizes, and alternate the directions the blooms face. Tie ribbons to each end of the circlets (see top right), leaving enough to trail. Use them to tie the crown on head. For step-by-step flower crown instructions from Blythe herself, watch our video here. 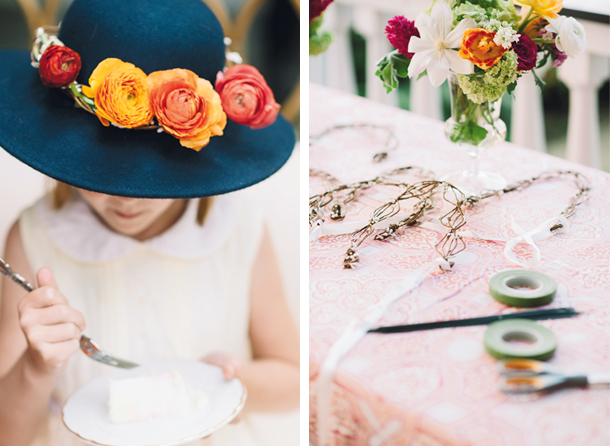 Find Blythe’s garden party tips and tricks and see more images from the gorgeous feature here. To read more from our April Garden Issue, click here.